Our traditional sewn flags are made using quality MOD spec run resistant woven polyester and our printed flags using quality knit polyester (NOT sheet nylon). Each flag is finished with a strong canvas, rope and toggle, triple sewn fly end and supplied with a complimentary shower proof drawstring flag bag for safe keeping. Where flags are fully SEWN with detail, applique is sewn through a layer giving a sewn mirror image on reverse. Where there is large detail, it would only be possible to make the fully sewn flag at certain sizes. Where flags are part-SEWN part-PRINTED, a sewn woven polyester base is sewn and hemmed and the detail (badge, emblem etc.) is printed twice and sewn to each side of the flag around the detail (bagged). Where flags are fully PRINTED, flags are single layered, printed through with mirror image on reverse. Most flags are single layer. This allows flags to fly nicely in the wind as they are lighter in weight. 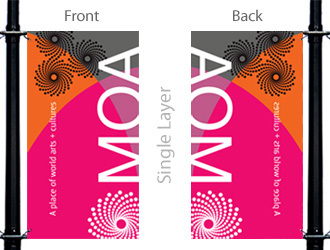 When printing single layered flags the back will be a mirror image. Double layered flags are less common than single layered flags and are made by taking two printed or sewn flags and sewing them together with a blockout liner between the two outer layers. Each side will read correctly with minimal light showing through and double layered flags can be used indoors or outdoors. However, the extra weight may affect their flying and make them sag or "pillow". 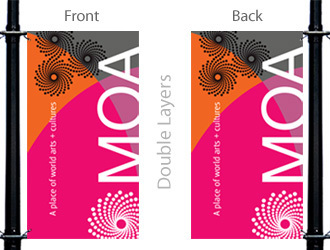 When displaying a printed single layered banner, the back will show the mirror image. Most banners are produced in this manner. As they are lighter in weight, they will "flutter" in the wind, which will catch the passerby’s eye; this is one of the purposes of the banner. Double layered banners read correctly on both sides. They usually include a third layer of lining made of either lightweight Tyvek* (*cannot be exposed to high heat through ironing or drying) or the heavier and more lightfast blockout nylon to minimise light showing through. Since double-sided banners are typically displayed with tension, the extra weight only minimally affects its flying. However, the banner arms may be affected as the banner weight is significant greater with double-sided banners. As well, they require more care in laundering and drying if necessary. As with banners and flags, single layered feather flags are the most common and the mirror image shows on the back. Double layered feather flags will read correctly on both sides but are less common than single layer. The double layered feather flags consist of two printed flags sewn together with a liner to make them more opaque. Depending on how the feather flag attaches to its hardware, the flying can be affected by the extra weight of the layers. Double layered feather flags may also have "pillowing".